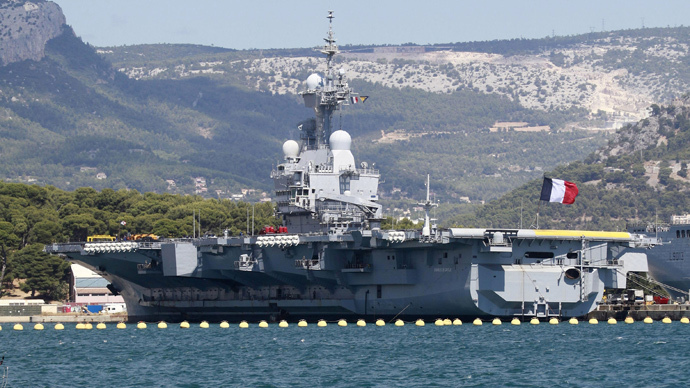 France has deployed its Charles de Gaulle aircraft carrier against the Islamic State (IS, formerly ISIS) in Iraq, as part of the US-led military campaign, French media report, citing government officials. "The integration of the Charles de Gaulle in the operation... (in Iraq) begins this morning," a member of Defence Minister Jean-Yves Le Drian's staff told AFP. The agency reports that the first Rafale fighter jet took off from the aircraft carrier on Monday morning. The warship was sailing about 200 kilometres (120 miles) off the coast north of Bahrain in the direction of Iraq. Jets sent from the carrier reach Iraq twice as fast as those, flying from their base in the United Arab Emirates. France announced sending the Charles de Gaulle aircraft carrier for use in military operations against the Islamic State in Iraq in mid-January. The decision was made in the wake of the deadly Paris attacks, when Islamist gunmen killed 17 people at the offices of the satirical magazine Charlie Hebdo and a kosher supermarket. France joined the US-led coalition carrying out air strikes against IS militants in Iraq in September. It has declined to participate in the aerial campaign against the group in Syria, where the government of President Bashar Assad has condemned the attacks on Syrian territory. The Charles de Gaulle carrier is the largest Western European warship currently in commission, and is France’s only nuclear-powered surface vessel. The ship can carry 20 to 25 aircraft, including Super Etendard strike fighter jets, Rafale M multirole fighter jets and Aster missiles. The carrier is currently accompanied by an attack submarine, several frigates, including a British anti-submarine boat and a refueling ship, Reuters reports. France operates nine fighter jets from its base in the United Arab Emirates and six Mirage fighter jets from Jordan.